The CCGS Private Robertson a sister ship to the Corporal Teather. 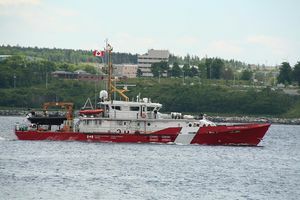 CCGS Corporal Teather C.V. is the third of nine vessel in the Canadian Coast Guard's Hero-class patrol vessels. She was delivered to the Coast Guard in February 2013. All nine vessels in the class are named "after heroic Canadians who put their duty ahead of their safety in service to our country.". The CCG's hero class vessels are based on the Damen Stan 4207 patrol vessel design, while the United States Coast Guard introduced vessels based on the slightly larger Damen Stan 4708 patrol vessel design -- named after USCG heroes. While the CCG vessels' maximum speed is 25 knots the USCG vessels' maximum speed is 29 knots. The CCG vessels' expected complement is 14 -- nine CCG seamen, and up to five fisheries officers or police officers -- while the USCG vessels' complement is 22 USCG seamen. The CCG vessels' endurance is 14 days, while the USCG vessels' endurance is 5 days. The vessel is named after Robert Gordon Teather, a 30 year veteran of the Royal Canadian Mounted Police. In September 2013 the City of Kingston, Ontario began considering making accommodations for a permanent downtown berth for the Teather. Originally Oshawa, a mid-sized industrial city, east of Toronto was considered for the Teather's permanent berth. While Kingston was once a port for 19th century sailing vessels in the 21st century she is mainly home to pleasure craft. The location was chosen for its strategic location -- close to the outflow where Lake Ontario empties into the St Lawrence River. ↑ Michel Vermette. Canadian Coast Guard Fleet Renewal Conference: New Paradigms for Defence Procurement and Industrial Policy?, Queen's University, 2012-02-27, p. 10. ↑ In Memoriam — RCMP Relations (December 5, 2004). Archived from the original on 2005-03-02. Retrieved on 2005-05-15. This page was last modified 13:29, 14 May 2015.